Thermal Modelling is used to establish the heating, cooling and hot water loads of buildings, before designing a system to meet those needs. ICAX IHT™ systems are designed to give optimum performance for the capital outlay for each project. An initial step is to determine the heating, cooling and hot water loads of the building. A full thermal modelling exercise should be undertaken to establish these loads. If the loads are not known ICAX can perform the thermal modelling to ensure that thermal balance is achieved, as part of the turnkey supply of IHT™. The optimum efficiency of a building design depends on a range of criteria and design decisions made by the building project team. This includes orientation, shading, material choice and component specification, thermal mass, environmental systems including ventilation strategies, building use and management. All of these criteria affect the heating and cooling and hot water loads of a building. Once the building loads are established, ICAX defines the optimum size and type of ICAX Solar Collectors and ICAX Thermalbank stores for each project. The modelling takes into account local geology as part of the design package for IHT. The ideal is to balance the heating deposited in the ThermalBank in summer with the heat extracted for heating in winter so as to achieve a thermal balance across the year. The balance may be easier to achieve if heat is extracted from the building in summer (and this also provides a highly efficient means of cooling the building). If vertical ThermalBanks are to be used, it is strongly recommended that a Thermal Response Test is undertaken on the first test borehole to give accurate inputs for the local geology, so that the borehole array can then be correctly sized for that location. Other Thermal inputs, such as excess heat from flat plate solar collectors, or waste heat form chilling plant, may also be an important part of the overall thermal balance of the project, and these will be accounted for in the modelling. For ICAX to design the overall thermal model for a project we need to have an accurate picture of the thermal loads and cooling loads of your building. You, or your M&E consultants, may be able to provide this. If there is doubt about these loads then we can be engaged to help establish an accurate model. ICAX’s thermal modelling expertise is based on over a decade of modelling experience, and possibly the most comprehensive site data for ground heat movement in the world, drawn from our own projects.ICAX are heat pump experts and experts in thermal modelling. Why is Thermal Modelling important? Thermal Modelling is critical to good design in any installation of a ground source heat pump. The sizing of the ground loop is key to the successful operation of the heat pump. 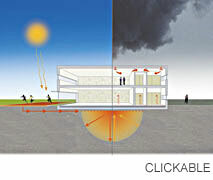 Before sizing the ground loop correctly it is necessary to understand the qualities of the ground to be used as well as the expected heating loads and cooling loads of the building and these will be affected by the design of the building, its orientation to the sun, the activities in the building and the ventilation strategies. These are complex issues which need to be analysed in a thermal model to ensure that the ground loop meets the temperatures required in the building throughout the seasons of the year in a well balanced and sustainable way – year after year. Achieving Thermal Balance over the year is important in order to create a sustainable system. If a ground source heat pump is used to extract more heat in winter than the amount of heat replaced in summer, then there is a risk that the ground temperature will fall each year. As the ground temperature falls, the CoP of the heat pump falls and the cost of operating the heat pump will rise each year. If the annual cooling load of a building is larger than the annual heating load then there is a risk that the ground temperature will rise year-by-year. As the ground temperature rises it becomes more expensive to use the ground as a heat sink for cooling. For an Interseasonal Heat Transfer system ICAX uses Thermal Modelling to ensure that the heating loads and cooling loads are designed to be matched over the year. If a system becomes unmatched (because of unusual weather patterns, or change in use of the building from original intentions) then ICAX can re-balance the system by collecting more energy from its solar collectors in summer. Alternatively the collectors can be used as asphalt heat rejectorsto reject excess heat at night, or in wintertime.